When Scott Miller published From Assassins to West Side Story in 1996 it was aimed at directors, performers and students of musical theatre. Perhaps not surprisingly it was at least as popular with fans who lapped up Miller’s authoritative and idiosyncratic dissection of sixteen of the 20th Century’s most significant pieces of musical theatre. The first volume was followed in 2000 by Deconstructing Harold Hill and now a third that bears the subtitle ‘Broadway’s Groundbreaking Musicals’. 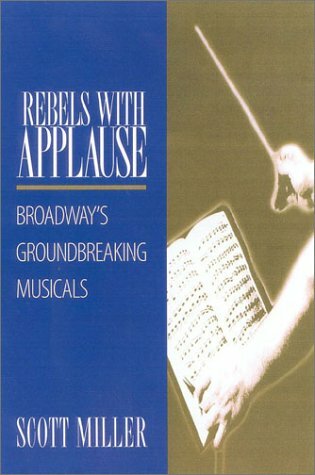 Rebels with Applause examines ten musicals that have, in their different ways, taken the established rules of the genre and expanded them in new and innovative directions. While some may disagree with Miller’s selections, none can quarrel with the range of his choices. Any survey that ranges from Oklahoma to Mark Savage’s The Ballad of Little Mikey and discusses each of its subjects with equal authority has to be worth a look. His choice of newer work is particularly interesting. While others have acknowledged the significance of Adam Guettel’s Floyd Collins, rather fewer have singled out Jason Robert Brown’s apparently plotless Songs for a New World. Miller’s careful analysis of the show teases out its recurring themes – in particular the way in which people react to life changing events – and helps to illustrate the emotional appeal of a piece which may, on first hearing, appear to be little more then a loosely related cycle of disparate songs. Miller clearly sees musical theatre as a significant and (in the best sense) worthy art form that is alive and well and more than strong enough to survive is current dumbed down image and the relatively low esteem in which it is held by many critics and, indeed, theatre practitioners. Not that he is above acknowledging that the genre can sometimes be its own worst enemy by churning out mix and match scores whose sole purpose seems to be to give the audience something to listen to while they watch the scenery move. In his introduction, Miller makes no apology for allowing his own social and political views to influence the discussion of each of his subjects&#146; themes and content. In fact, it is these highly informed yet robust opinions that are the appeal of his work. One may not agree with everything he writes but it will certainly generate discussion and debate. For example, this writer was particularly gratified to see Miller acknowledge the significance of Pal Joey (which appeared 3 years before Oklahoma) in introducing such innovations as adult discussion of sexuality and unlovable leading characters into musical theatre. On the other hand, I cannot entirely share his enthusiasm for Rent which has always seemed to me to be a reactionary work that succeeds by virtue of sanitizing the very society it claims to celebrate. However, I still enjoyed his perceptive analysis of both pieces’ strengths and weaknesses and I’m willing to bet that most readers will find many new insights into shows with which they are familiar as well as being left with the desire to explore further those they don’t know so well. For all his passion for musical theatre, Miller takes a realistic view of his subjects. While noting the importance of Anyone Can Whistle in bucking so many of the established conventions of musical theatre – in the same year that their very apotheosis, Dolly Levi, made the first of her innumerable visits to Broadway – he is not blind to shows’ faults. It is this rigor that, ultimately, makes his books so fascinating. Miller’s writing about musical theatre may not be as entertaining as Ken Mandelbaum‘s, as witty as Ethan Mordden‘s or as literate and barbed as Mark Steyn‘s but what he does is unique. Like these authors, his work is an antidote to the kind of bland, coffee table picture books that overpopulate the genre.